Get the classic look of a wood bistro set with the durability of metal in the Avery Bistro Set. Made out of rust-free aluminum, this bar height bistro set is designed to appear to be make of painted wood. The table sits above the seat level making for convenient, comfortable access and plenty of room for your legs beneath, and also comes with a wide and sturdy X-shaped base and four vertical support beams. Stylish striping on the cushions goes perfectly with the lines on the table and makes for a very handsome looking set. 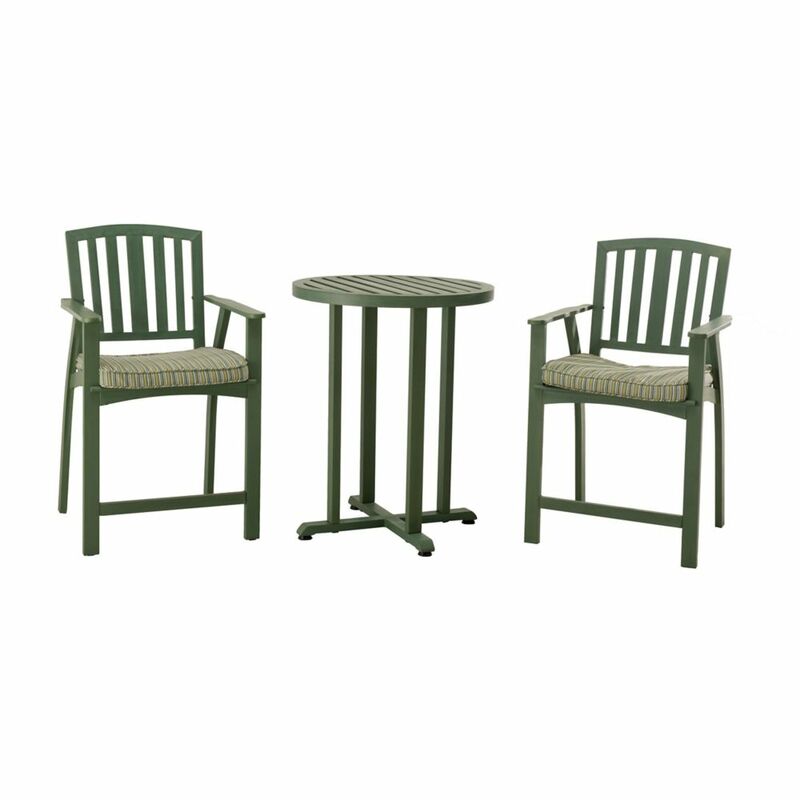 Comfortable and casual, the 3 PC French Folding Cafe Bistro Set is classic with a modern sensibility. Perfect for the patio, porch or sunroom, this 3 PC French Folding Cafe Bistro Set combines a sturdy rust-resistant, steel-reinforced frame with all-weather resin wicker to help withstand the outdoor- or indoor elements. This 5-piece Fully Woven Chat Set offers a stunning look for a smaller space. It is perfect for relaxing, reading, and just enjoying the outdoors. The set includes a pair of cushioned chairs with matching cushioned ottomans, and a full-size side table, with a woven shelf. The 2-toned woven wicker and blue cushions blend iwth any decor. The ottomasn can be used as a comfortable foot-rest or as stools for extra seating and they easily store below the chairs. The set is fully-assembled and easy to maintain. The solid, powder-coated steel frames ensure that this set will provide outdoor enjoyment for years to come. Dine in comfort and style with the Hampton Bay Kings Square high bistro set. The 2 swivel chairs feature durable steel construction, olefin cushions in a beautiful red fabric, and plush lumbar pillows for added comfort. The square bistro table is balcony height and has a lattice tabletop pattern that coordinates with the chair backs to create a decorative and uniform set. Avery Bistro Set Get the classic look of a wood bistro set with the durability of metal in the Avery Bistro Set. Made out of rust-free aluminum, this bar height bistro set is designed to appear to be make of painted wood. The table sits above the seat level making for convenient, comfortable access and plenty of room for your legs beneath, and also comes with a wide and sturdy X-shaped base and four vertical support beams. Stylish striping on the cushions goes perfectly with the lines on the table and makes for a very handsome looking set.